This blog post originally appeared on Teaching Channel as part of a publishing partnership with the Center for Teaching Quality. 67% say the Internet has a “major impact” on their ability to interact with parents and 57% say it has had such an impact on enabling their interaction with students. It’s commendable that a majority of teachers are finding ways to bring digital tools into the learning process and help students “access content.” But now we need to work with students to create content as well. Yes, our students need information literacy skills. But they also need the ability to code, curate, and create content to share with a wider audience. When students can reach an audience of more than one (their teacher), they can get feedback from variety of sources, become more invested in their work, and gain valuable skills in the process. Mrs. Paluch, a third grade teacher in a charter school in Philadelphia, is making her students’ work public as they uncover the country of Brazil, complete a unit on fairy tales, and help out their kindergarten buddies. Parents, grandparents, and colleagues can catch a glimpse of the teaching and learning that is happening in this third grade classroom. Knowing that others will “see their work” motivates students and helps teachers like Mrs. Paluch reflect on their practice. Sarah Mulhern Gross offers a glimpse into an entire school community, pausing to highlight excellent student work. On this blog, you will find examples of student writing, artwork, presentations and much more. Carving out a space to give student work a digital spotlight emphasizes the point that students are writers and creators and not just consumers of content. 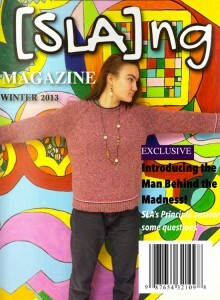 During the second quarter, my students at the Science Leadership Academy produced a teen magazine. After examining articles after which they could model their own work, they created their own teen magazine, covering topics such as music, art, time management, and Philadelphia’s food scene. My students learned about everything from research to writing to design and layout. So far, more than 2,000 people have clicked on our magazine and examined the students’ work. What are some examples you’ve seen lately that make students’ work public in compelling ways, motivating learners and letting community members know what actually happens in the classroom? Meenoo Rami is a National Board Certified English teacher at the Science Leadership Academy in Philadelphia. She also runs a weekly twitter chat for English teachers via #engchat. She is a teacher consultant with the National Writing Project and a member of the Center for Teaching Quality’s virtual community.